Preview 10 & 13 July - PCC host two big National Cup ties - These will be great ones to watch! This coming Friday and Monday, PCC host back to back cup ties that will be super for spectators to enjoy. On Friday 10th - we host Guildford and Godalming in the National Inter Club Shield (for teams restricted by handicap). 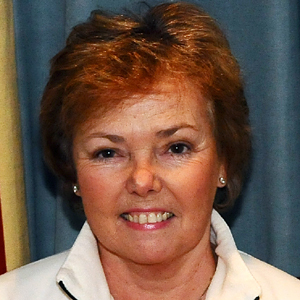 - PCC: Mike Fensome, Frances Colman, Roger Goldring, Mary Gaynor. On Monday 13th - we host Champions Dulwich in the top National Inter-Club Championship - expect to see Pierre Beaudry (handicap -1) and at least five scratch players on show! - PCC: Chris Roberts, Carole Jackson, Ian Norris, David Hopkins. Your support for both teams will be very appreciated. Both matches start at about 1000 and will conclude around 1630. 10 July - PCC reach National Inter-Club Sheild semi-finals for first time! Although not leaving it until the last hoop as they had in the previous round, Phyllis Court did sweat some in getting past a very game Gulidford and Godalming team in this Murphy shield quarter-final. And it wasn't just the beating sun that turned up the heat, as the match went into a deciding game once again. Phyllis Court got off to a good start by wrapping up the doubles rubber in quick time. The host's Mike Fensome and Frances Colman kept up their winning record as a doubles pair in this competition, with a two game victory over Mike Huxley and Barry Gould, and the top two players then decided to make a start on their single match-ups. Meanwhile Andrea Huxley pulled the tie level for the visitors, also in straight games, against Mary Gaynor, and the only first round rubber to need a third game was Roger Goldring's match with Mark Godfrey-James. This was an interesting one where the former's growing GC experience eventually proved the difference over the latter's stylish AC accuracy. So Phyllis Court held a 2-1 lead at lunch, with the early playing of the first of those top half singles poised at one each. Fensome duly wrapped up his singles rubber soon enough against Mike Huxley, and Colman pulled her tie with Gould level before being frozen out of the decider. Guildford now trailed 3-2 and needed both remaining matches. Godfrey-James did his bit in two games against Gaynor and so it was all eyes fell on Goldring v Andrea Huxley where the Phyllis Court man held a first game lead. The pair had met several times already this season in National B-Level Series encounters and Goldring had established a good lead in their 'head to head' games. However Huxley improved greatly in the second game with confident center-ball clearances and positive hoop runs to level the match and fixture 3-3. Goldring re-focused in the decider and made some bold, if somewhat non-textbook shot decisions, but fair play he pulled them all off. Trailing, Huxley was forced in into higher risk shots herself to save the day and, as happens so often in such circumstances a slight error gifted Goldring a winning hoop 10, game, match and the fixture. This was another exciting tie and good advertisement for this restricted competition. Phyllis Court will next entertain their good friends Hamptworth for a place in the Final. In continual rain all day, National Champions Dulwich sank PCC's dreams of second victory in four days in National Inter-Club matches. After Friday's great win for our Murphy shield team (see below), sprits were high as PCC stepped up to face the challenge of the Londoner's who have won the Championship (which is the country's premier GC team event) for the last two years. Dulwich were lead by the vastly experienced Belgian International Pierre Beaudry (minus 1 handicap) who is currently no.14 in the UK rankings and also fielded two other players who were 'scratch' handicaps and in the UK to 40. 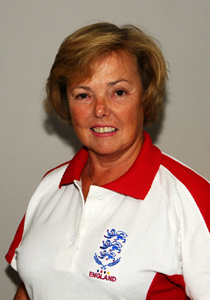 Carole Jackson is a former South African International player at but AC and GC and her partner David Hopkins has previously represented England at GC - both are '0' handicaps. Chris Roberts (0) paired up with Jackson or the morning doubles but found Dulwich too strong in two fairly quick games. In the morning singles, Hopkins lost so closely 6-7, 6-7 and our fourth team member Ian Norris lost in three games. So there was hope for the afternoon but we would need to win all of the remaining singles ties. It was not be though, and Dulwich wrapped up the fixture result when Beaudry's accurate centre-ball clearances and long hoop runs out did Roberts and the heavy rain soaked lawn did for Jackson in her rubber. 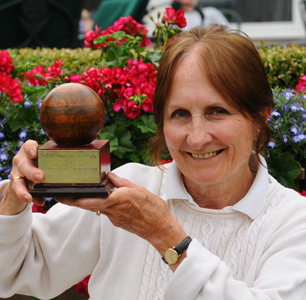 Dianne Browne won our Annual One-Ball Handicap tournament today for the fisrt time. She was the clear winner after six rounds of this Swiss style enent, ahead of an improved field of 14 players. After three days of tough competition at Nailsea (near Bristol), the fancied three Australians and one English woman emerged at the top of a field of 14. All competitors, bar one of the Ausies who destroyed the filed, found the very firmly set hoops in bone dry and somewhat uneven courts, a real challenge and long breaks were hard to come by. Frances had a disappointing first day but bounced back with two good wins on day two. But by the start of day three, qualification was all but impossible and Frances' pushing of the top English woman to just a single point victory in her last game, was a nice way to round off this very competitive yet friendly and very enjoyable tournament. Both Helena and Mike Fensome were doing well at the Spanish GC Open and both were on course to qualify for the knockout phase, when poor Mike had a nasty fall over a hoop, gashed his leg and ended with his arm in a sling. His tournament ended there and then, whilst Helena made the cut after a play-off and won her first knock-out match. Defeat in the next one put her into the secondary Shield event where she was beaten in the final (to finish 6th overall). The familiar figure of Surbiton's Stephen Mulliner beat local hero Jose Riva in the climax of the main event. Mike, who missed out on this week's National Veterans Championship (attended by Helena and fellow PCC members Carole Jackson and David Hopkins) will be out of a action for a few weeks no doubt - get well soon Mike! It was good to welcome Pat Eades and Bruce Mason back to competition croquet after lengthy absences for different reasons, and lovely to see the pair run-out victorious too. They beat Ian Norris and Denise Keir in a close final that had a strange ending at the12th hoop when Pat 'tidied pink off the lawn. She mistakenly believed that it belonged to a double banked game that had juts finished, only to then realise that it belonged to her opponent Ian! She an Bruce recovered from this 'wrong ball' situation within a few shots and rounded off a sweet victory nevertheless. The field of 16 players (8 pairs) was disappointing again and it does seem, that with players engaging more in singles tournaments and season-long competitions, that perhaps next season the running three Drawn Partners events should be reviewed. Our AC Handicap League team played their second match of the season and gave debuts to Derek Toms and Hugh Crook. 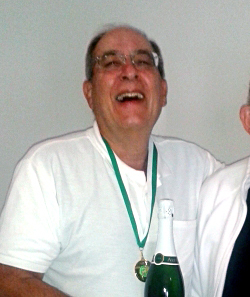 Richard Peperell reports: Roger Goldring had another cracking time this weekend at Hamptworth's 2-day B-level Tournament in winning on the narrowest of margins when he defeated Ian Shore (High Wycombe) in the finals-block in the rain. Both Ian and Roger won two games in the finals-block and the other two players had only won win, but as Roger had beaten Ian, Roger took the title. So that's two B-level wins for Roger this year. 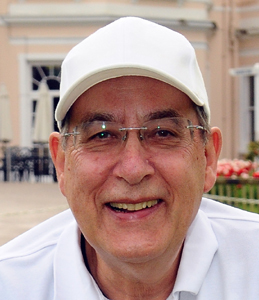 Richard can also be happy because he achived some good wins, including beating Roger ab the early game, and then ending up with an index score of 503, which made him a 3 handicap. - A handicap reduction for DerekToms and Delia Norris too! A string of good results in team matches as well as individual competition victories, has earned Derek Toms and Delia Norris sufficient index oits to trigger handicap reductions in the past few days. Derek goes from 9 to 8 and Delia from 6 to 5, which is her third derduction this year! reduce her handicap down to a new low of 5 today. High Wycombe pulled a 'fast one' with the selection of top coach Cliff Jones and rising AC star Joel Taylor for their visit to Phyllis Court today. But our team was too good for them in the continual rain as we won all three morning rubbers and then Carole Jackson won us the tie with a win in the afternoon. That gave us a winning 4-1 margin and so we decided to half the unfinished rubbers for a 5 - 2 score line. PCC 'A': Chris Roberts, Carole Jackson, David Hopkins, Helena Fensome. Hopkins and Fensome, illustrating that he is much improved and on the probably on the march to a lower handicap). Meanwhile PCC 'C' had to abandon their match with Wingrave today, when the Leighton-Linslade courts became unplayable during continual rain. With the fixture halted at 2-2, the other rubbers were halved for 6-6 recorded scoreline. Derek Toms won the 80+singles tournament today for the first time today. 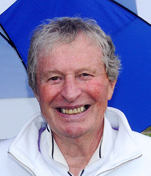 He beat Don Rutherford in the final, whilst former double winner Robin Morrell and Philip Allison shared third place. Others participating this year were: Denise Keir, Ray Broadhead, Ralph Chambers and Lionel Wilding. 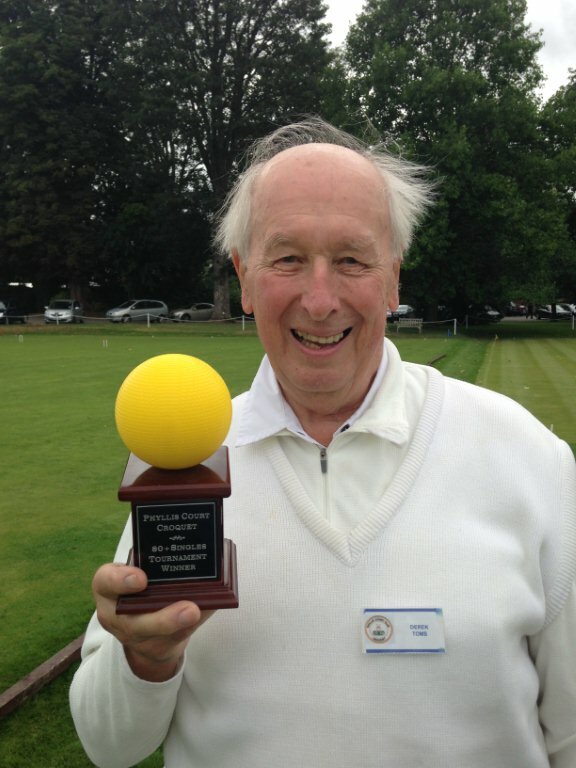 PCC (AC) Handicap scored their third draw of the season when they entertained Eynsham. Harry Midgley and Elizabeth O'Dair both won their matches, whist June Robinson and Raghu Iyer found their opponents tougher propositions. A resounding 5.5 to 1.5 win over Ryde on the Isle of Wight today, left PCC 'A' dreaming of a first ever SCF Level League title. With one fixture left (at home to Littleton on Monday week), they are now firm favorites to win the league. 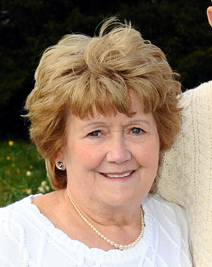 Although dropping a game each along the way, Helena Fensome and David Hopkins showed good concentration to win both their morning and afternoon singles rubbers and Carole Jackson enjoyed a long and very close three game match with old adversary Roy Tillcock in recording another victory. Chris Roberts was not on his best form and went down in straight games to the much improved Stuart Peters, and with the match result decided, Jackson and Roberts' doubles rubber, which had been suspended at a game each, was left unresolved and 'halved'. - A shadow 'second string' fixture was played alongside the league encounter, and Ryde got their own back in that one. Don Rutherford won his afternoon singles match but Ryde cleaned up all the others for a 1-6 score line. It was a lovely day, playing good croquet friends, who looked after us wondefully. PCC 'A' - Carole Jackson, Chris Roberts, Helena Fensome, David Hopkins. PCC 'Second String' - Frances Colman, Raymond Wood, Don Rutherford, Pat Eades. A PCC 'Friendly' team of four had a lovely day out at Hurlingham but found the hosts fast and manecuired courts difficult to adapt to. They were beatedn all ends up in four doubles matches and then 5-11 in the singles although did come back to win three orf the last four games. PCC 'Friendly' - Raghu Iyer, Hugh Crook, Pat Eades, Joanna Iyer.